Aprimira is a new hybrid mirabelle - apricot. 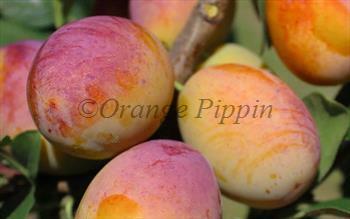 The fruits are very sweet, and relatively large by the standards of mirabelles - more like small apricots in size. However in most other respects the mirabelle side of the partnership is more prominent, and Aprimira is best considered as a large pink / yellow-flushed mirabelle. The blossom is plain white, and appears at about the same time as the leaves. The fruits ripen gradually in early to mid-August, at about the same time as Victoria plums, and can be picked fresh from the tree over an extended period. The fruits will also keep fresh in a fridge for about a week - longer than most dessert plums. The flavour is especially sweet and the stone falls away cleanly from the flesh. Aprimira® is a protected variety. Please fill in the details below and we will let you know when Aprimira mirabelle trees are back in stock. Aprimira is in flowering group 1. Aprimira is self-fertile and does not need a pollination partner, although fruiting may be improved if there is a compatible tree of a different variety nearby. Aprimira is self-fertile, and flowers very early in the spring, making it a useful pollinator for other very early flowering plum species, including pluots, cherry plums and other mirabelles. Aprimira was developed at the Geisenheim research station in Germany from a Mirabelle von Herrenhausen, and released in 1994. Mirabelles and apricots are closely related members of the Prunus family, and many of these varieties will naturally cross-pollinate each other so there is great scope for interesting hybrids.